After her CIA operative brother disappears, leaving behind only a cryptic message, armed men target former agent Rachel Simmons for information. But with help from her ex, Agent Alex Booth, Rachel eludes them, trekking into the mountains in search of her brother. Pursued through the wilderness by highly trained - and very familiar - men, can Alex and Rachel expose a conspiracy that goes deeper than they ever imagined? 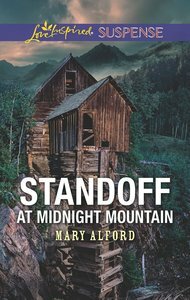 About "Standoff At Midnight Mountain (Love Inspired Suspense Series)"
Mary Alford wrote her first novel as a teen and was hooked.<BR><BR>Mary loves hearing from readers, so please send her an email at: maryjalford@netzero.com and check out her upcoming releases at www.maryalford.net. Chased across Amsterdam by a human-trafficking ring, social advocate Kayla Brooks refuses to help them recapture Mercy, the young girl she rescued from their clutches. Even if they've already abducted her father as a hostage ... and wouldn't hesitate to kill her. There's only one man Kayla can turn to for help: her ex-fiance's brooding older brother, Levi Cummings. Though Kayla relies on the handsome former army intelligence officer's experience, fully trusting Levi seems impossible after she helped send his brother to jail. But as they struggle to save her father, protect Mercy and outmaneuver the traffickers, Kayla and Levi's bond transcends pure survival. Armed with only a few clues about her father's location, though, Kayla and Levi must bring down the crime ring ... or lose all their lives.